Versatile Single Light Beam Safety Devices are used in the printing and packaging area. It is an advantage here to use a Light Beam Safety Device that combines numerous functions in itself. Because of its functional diversity, the SLSR 8 Light Beam Device is a true multi-talent. It has an active ambient light suppression and push-pull switching outputs, and many more features. It is protected by a robust metal housing that provides IP 67 protection rating and can be used in tough industrial conditions in a temperature range from –40 to +60 °C. Together with a test monitoring such as TNT 35 or an MSI Safety Interface, for example, the SLSR 8 forms a type 2 active opto-electronic protective device. 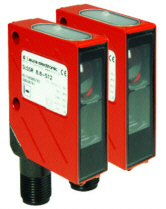 Purchase your Leuze SLSR 8 Single Light Beam Safety Devices today!